The Plot: While Aura lays near-death in the hospital, Override decides she needs a nest egg if he dies during the Gathering of Five ceremony. He robs a bank and is eventually caught by Spider-Man, who’s swung past the panic he’s caused in the streets. The police are unable to hold Override, however, and he quickly retrieves the hidden money and returns to the hospital. The Subplots: MJ talks to Peter about quitting college, but he refuses to believe that she values modeling more than her degree. After selling the photos of his fight with Override, Peter is able to buy the expensive textbooks MJ needed. When he hands her the books, MJ confesses that she withdrew from college earlier today. Peter realizes that MJ needs to be happy and tells her that he supports her decision. Web of Continuity: MJ is still undecided about returning to modeling this chapter, even though she visited the agency and signed a contract in the previous chapter. I Love the ‘90s: Spider-Man sings the lyrics to the Fastball song “The Way” while pursuing Override. Production Note: This issue is forty pages, as opposed to the standard thirty-two. You might assume that some extra pages are thrown in because this is the last issue of Sensational, but that’s not the case. The story runs twenty-three pages, and there’s one page of letters. The rest of the pages are ads. Miscellaneous Note: The Statement of Ownership has the average sales for the year at 94,643 copies, with the most recent issue selling 89,299.
Review: It’s hard to argue that as a cohesive storyline, “The Gathering of Five” has been a success. The various chapters contradict one another, plot threads disappear at random, and the only real conclusion to any arc is to a subplot involving MJ’s career choices. I doubt this did an awful lot to build excitement for the new direction; knowing that the weakest chapter of the crossover was written by the main writer of the upcoming relaunch had to give many readers pause. And labeling this the “conclusion” of the storyline, when it seems as if the previous chapter actually takes place after it, is just typical of the lax oversight the titles seemed to have during this era. Todd Dezago probably could’ve hacked out anything as the final chapter, given that this is also the title’s last issue and it doesn’t seem as if there’s much of an emphasis on quality control anyway. Thankfully, he once again produces a solid issue that stands on its own, putting to shame some of the other chapters of this storyline. The Override fight isn’t that compelling, Spider-Man even stumbles upon the villain the exact same way he did last issue, but Dezago excels at the human element. Not only do Peter and MJ feel like fully realized characters, but even Override and Aura are treated with genuine care. I’ve never given a second thought to these Clone Saga leftovers before, but Dezago manages to make them feel real for the first time. Aura, living in constant pain, wishing to end it all but not knowing how to tell her husband…Override, racked with guilt over what he’s done to keep Aura alive, unable to let her go while there’s still a shred of hope. These aren’t easy scenes to execute, but Dezago handles them extremely well. The Peter and MJ scenes are also among Dezago’s best work on the title. Both characters feel real, neither is allowed to turn into a caricature of the nag or the screw-up, and the drama and resolution don’t feel forced. Yes, MJ’s returning to modeling as a part of the “back to basics” edict, but the script does a decent job of selling this as a legitimate choice for MJ to be making. And that bit with the textbooks is classic Spidey. Sensational Spider-Man was created as a replacement for the rather superfluous Web of Spider-Man series, but two and half years later, it’s also cancelled due to its own perceived redundancy. With four monthly titles, it was always hard for the title to stand out, and it seems that the focus on lighthearted adventure just added to the perception that it was a book that didn’t “count.” Amongst diehard Spider-Man fans, however, Sensational was regarded as one of the highlights of the franchise during this era, and I don’t disagree. My major complaint about the series was that it often seemed too light for its own good, but this issue shows that Dezago certainly does posses a talent for writing rather complex characterizations and significant emotional dilemmas. 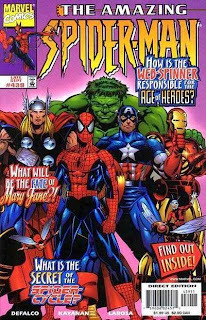 Who knows what a Todd Dezago/Mike Wieringo run on Amazing Spider-Man could’ve been if Marvel had given them a chance? The Plot: Two bicyclists spot Spider-Man swinging overhead and decide to follow him throughout the day. 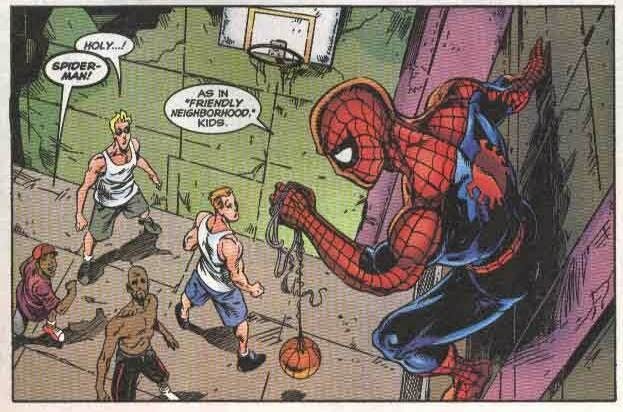 They witness Spider-Man stop a robbery, then help young kids on a basketball court. The bicyclists, annoyed at the lack of action, accidentally cause a multi-car collision while going through traffic. Spider-Man webs the duo up and hands them over to the police. The Subplots: MJ meets with her new modeling agency and is given a contract. 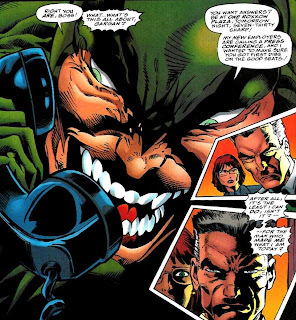 Elsewhere, Norman Osborn chastises a mystery man named Franklin over the phone. Franklin’s child listens in. Later, when Osborn arrives to pick Franklin up at the airport, he’s shocked at the person who arrives instead. Web of Continuity: The mystery Franklin’s child (who doesn’t make a full appearance this issue) is Mattie Franklin, the future Spider-Woman. Mattie will play a role in the early issues of the relaunched titles, and later receive her own series. Using the Wizard standards of the day, this issue counts as her first cameo appearance. Forever Young: Two people at MJ’s modeling agency remark that she’s “years out of the biz,” which means that even John Byrne seems to be acknowledging that years have passed since MJ gave up modeling, circa Amazing Spider-Man #325. 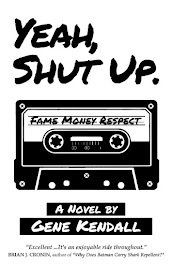 Production Note: The cover credits are incorrect, a repeat of the credits on PPSM #96’s cover. Norman Felchle does appear to be the cover artist this issue, however. 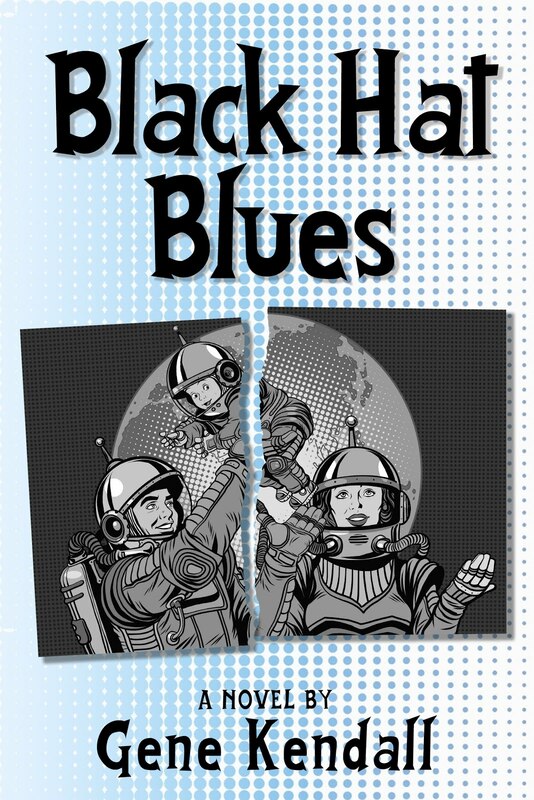 Review: So, while the last chapter was a shabby attempt to cram five issues of story into twenty-two pages, this chapter is allowed to squander most of its pages on small stakes “everyday” adventures. Surely someone working in editorial had to realize how utterly disjointed this crossover was going to be. I’m not saying that Byrne’s “day in the life” story is particularly bad -- it’s about as entertaining as a decent annual back-up and the material does suit Ross’ playful art -- but it’s bizarre that a chapter of this crossover is devoted to such mundane material. It didn’t occur to anyone to split the events of PPSM #96 into two chapters…and to drop that dragon nonsense? Also, where are Robbie Robertson and Alison Mongrain? Their story is totally ignored this chapter, after serving as the one subplot in the crossover so far that felt like it might actually be going somewhere. 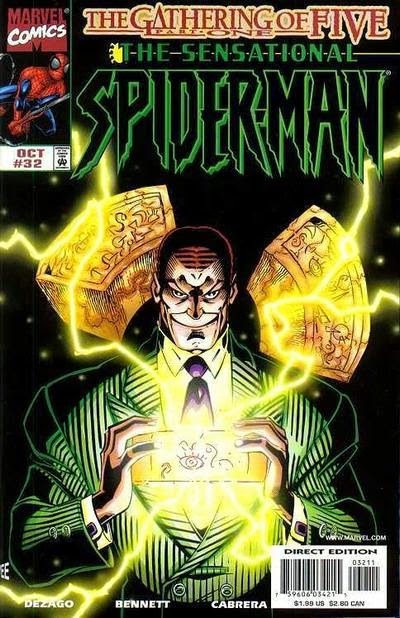 Instead of checking in on their flight from Osborn’s agents and search for Peter, the reader has to suffer through more pages of Norman Osborn procuring rare artifacts. That’s certainly exciting. More scenes of a middle-aged man yelling at other middle-aged men on a cellphone? Yes, please! And while it wouldn’t be fair to criticize this chapter for her brief cameo, it’s worth remembering that Mattie Franklin went on to become one of the most hated fictional characters in comics. Even when Marvel was pushing her debut series rather heavily, no one seemed to care enough to track this issue down. The Plot: At the Daily Bugle offices, Norman Osborn taunts Peter with information on a genetic bomb that’s killed dozens of innocent people. Jonah soon confirms this story is real, but is told by Osborn to drop the story or else his wife will die. Incensed, Jonah takes the gun from his desk and decides to deal with Osborn permanently. 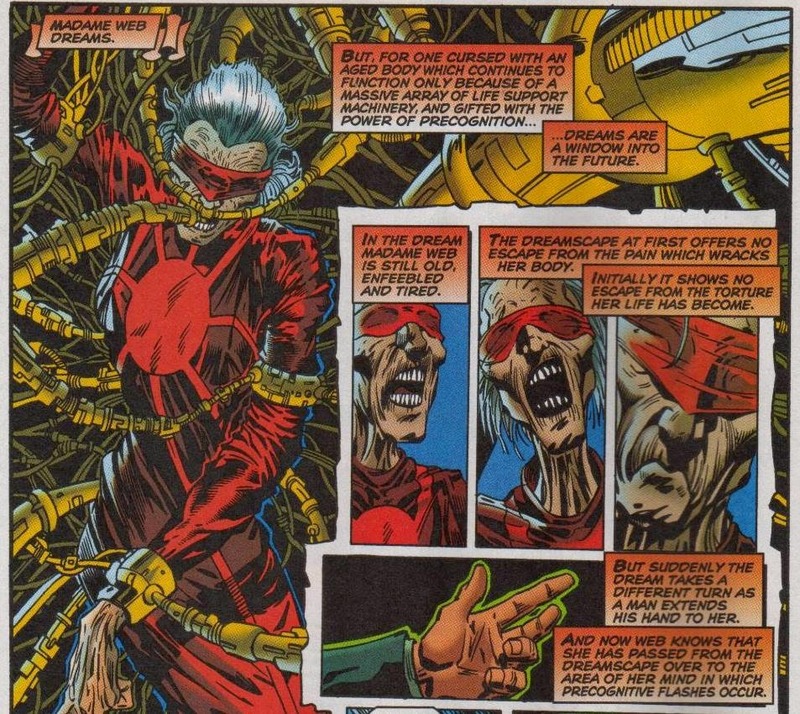 Elsewhere, Madame Web receives a telepathic message from Osborn, inviting her to join the Gathering of Five ceremony in order to regain her lost youth. Web telepathically contacts Spider-Man, tricking him into retrieving the necessary artifact and bringing it to her. She then receives a vision of Jonah shooting Osborn. 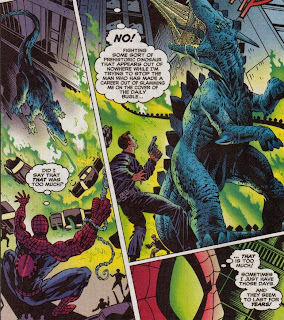 Spider-Man races back to the Daily Bugle, but is distracted by a gigantic flame-breathing dragon. After webbing up the dragon, he enters the Bugle just as Jonah has dropped his gun and given up. Osborn now prepares to shoot him, but Spider-Man saves his life. Jonah, humiliated, refuses to thank him. Later, Madame Web joins the ceremony, and has a vision of Osborn killing the world with a genetic bomb. The Subplots: Before Osborn enters the room, MJ brings Peter dinner and tells him about her modeling offer. Elsewhere, Alison Mongrain has abandoned Robbie Robertson. Osborn’s agent Creep attacks her, but she’s rescued by Robbie. Madame Web hasn’t appeared in the comics since Amazing Spider-Man #239, although she was a regular in the ‘90s animated series. The previous chapter took place during the day; even though the story is now set at night, Jonah still doesn’t know that Robbie and Alison have returned from Europe. 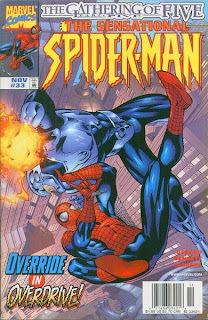 In the last chapter, Alison pressured Robbie into leaving Spider-Man during his fight with Molten Man in order to find Peter Parker as soon as possible. In-between chapters, Alison has given Robbie the slip and checked into a cheap motel room. Robbie has located Alison just in time to save her from the Creep (which is apparently his supervillain name). 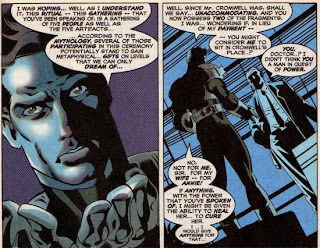 Norman Osborn claims he learned of the Gathering of Five ceremony while studying with the Scriers in Europe. I Love the ‘90s: While fighting the dragon, Spider-Man comments on the box office failure of 1998’s Godzilla. How Did This Get Published? : The dialogue and prose seem to be equally horrid this issue. “Huh?” Moment: This is the least of the issue’s problems, but MJ brings Peter a “Merry Meal” even though the art clearly shows the bag has a “Sappy Meal” logo. Review: Any goodwill the first two chapters might’ve generated is utterly evaporated by the time you’re finished with this issue. I remember the internet’s apoplectic reaction to this issue, but I haven’t experienced the misfortune of reading it for myself until now. This isn’t just bad, it’s X-Men Unlimited #4 bad. It’s X-Factor #Whatever-Issue-Graydon-Creed-Died-In bad. It’s Chuck Austen bad. Rather than devote entire paragraphs to every ill-conceived idea in the issue, I’ll spare all of us some agony and rely on the clean efficiency of a bullet point list. Any attempt to portray Norman Osborn as the cool, aloof behind-the-scenes villain is undermined every time Mackie is handed the character. Osborn’s idea of dropping subtle threats to Peter and Jonah is to describe in great detail something he’s already done. He’s confessing to multiple murders to people who work for a major metropolitan newspaper. Making this more insulting, there’s even a “You’d better kill this story or else” scene, as if no other newspaper in the world is going to report on a genetic bomb that causes people to melt mysteriously detonating in a random office building. Why is Osborn suddenly interested in murdering innocent white-collar office employees anyway? Traditionally, he wants to rule New York’s underworld and punish Spider-Man for standing in his way. He’s never been an indiscriminate killer before, has he? Mackie delivers perhaps his weakest scripting job so far on this title. (I’ve said that before, haven’t I?) Almost every page has at least one line of incredibly awkward, stilted dialogue. I don’t want to single Howard Mackie out for this quirk since a lot of writers do it, but constantly breaking the “that/which” rule isn’t only bad grammar, it also makes for some wretchedly pretentious writing. The Alison Mongrain/Robbie Robertson subplot feels as if it’s being continued from an entirely different storyline. What’s happened to them since the last chapter? Why is Alison in a motel if she wanted to see Peter Parker so badly? When did “The Creep” appear? Who is the Creep? There’s not even a clear shot of him during his one-page appearance. What is this? Speaking of “What is this?”…the entire structure of this issue is just bizarre. The story attempts to pay off Jonah’s rivalry with Osborn, foreshadow Osborn’s master plan in the “Final Chapter” crossover, revive Madame Web, continue the Gathering of Five plot, have Spider-Man locate the latest artifact, and develop the ongoing Robbie/Alison subplot. And for some reason, an unexplained dragon has to suddenly appear in the middle of the issue. Spider-Man’s efforts to retrieve the artifact for Madame Web are left entirely off-panel. That would be a disappointing anti-climax in any other comic, but Spider-Man even comments on what a “dangerous task” it was. Why is this scene totally removed from the story…especially when several pages are killed on that inexplicable dragon fight? 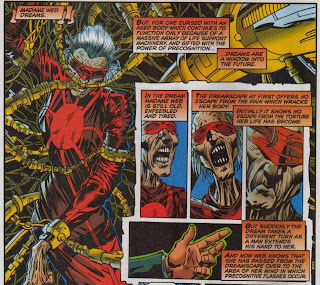 Why is Madame Web suddenly obsessed with regaining her youth? Has she ever been portrayed as someone who would outright lie to Spider-Man, sending him on dangerous missions that only serve her own vanity? The big Jonah Jameson/Norman Osborn confrontation, which the titles have been building to for about a year, consists of Osborn threatening Jonah’s family (again), and Jonah responding by throwing his gun away. Right in front of Osborn, who of course picks it up and turns it on Jonah. We’ve waited a year for this. Osborn, in one of his unbearable monologues, claims that his plans are finally coming to fruition. I realize he’s saying this now simply because the creators are wrapping his story up before the relaunch, but since the story is going out of its way to broach the topic…what was the point of buying the Daily Bugle in the first place? Allegedly, it’s to rebuild his reputation, but how could one newspaper do that? And if it’s to destroy Spider-Man’s reputation, that’s already the Bugle’s M.O. -- so, really, what was the point of the past year? 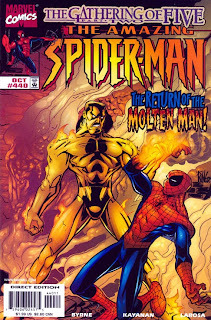 The Plot: Spider-Man chases a seemingly brainwashed Molten Man across Manhattan. Eventually, he realizes that Molten Man is on a mission to kill Alison Mongrain, who’s recently gotten off a tramp steamer with Robbie Robertson. Spider-Man distracts Molten Man while Robertson and Mongrain escape. 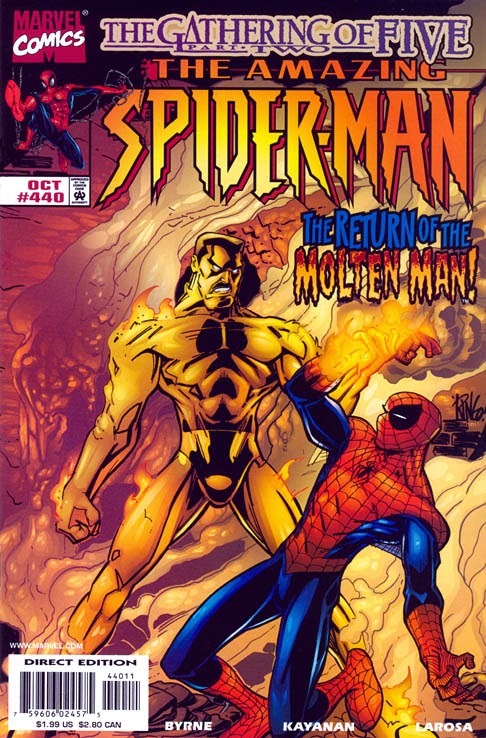 Molten Man’s powers cause the docks beneath them to catch fire, and soon Spider-Man and Molten Man are both in the water, in the path of a giant boat. Spider-Man escapes, but Molten Man disappears. Meanwhile, Norman Osborn gathers one more piece needed for the ceremony from an antiques dealer named Maxwell. Miscellaneous Note: The recap page summarizes the previous ASM issue, which was essentially filler, as opposed to the first chapter of this storyline. Review: This issue was billed as an “early start” for John Byrne, who was allegedly so excited to be a part of the relaunch, he just couldn’t wait for the new Amazing Spider-Man #1. 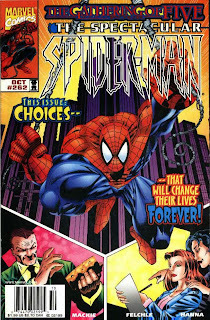 Reader response at the time seemed to be mostly negative, and not only because Byrne would be simultaneously rewriting Spider-Man’s first year in the Chapter One miniseries. As many fans pointed out, doing a soft reboot of the continuity and relaunching the titles with new #1s is utterly pointless if the storylines are just continuations of plots that begin before the relaunch. That’s a valid point, but I now wonder how people would’ve responded if there were no transition issues and Amazing Spider-Man (vol. 2) #1 simply dropped readers right in the middle of the new status quo. The response probably would’ve been even more hostile. The Subplots: A Scrier reports to Osborn that the “package” has been delivered safely. Robbie Robertson locates Alison Mongrain in Paris. MJ receives a call from a modeling agent, asking her to return to the business. *See _________ For Details: Override’s wife Aura was nearly killed in Sensational Spider-Man #25. He hopes that this ancient ceremony will give him the power he needs to heal his wife. I Love the ‘90s: Spider-Man swings past a movie theater promoting Wesley Snipes as Blade on the Marquette. How Did This Get Published? : “Man, there is just nothing better than catching the web-line express home after a long day of snapping pictures for the Bugle as freelance photographer Peter Parker.” I’m glad Spider-Man’s secret identity was smoothly inserted into that thought balloon, or else I would’ve been lost throughout the rest of the issue! Review: Marvel’s ready to pull the plug on this era of Spider-Man, although two poorly-received crossovers remain. “The Gathering of Five” is an attempt to seed a few storylines for the upcoming relaunch, and…that’s pretty much it, really. It would be nice to say that this era of the titles is given a proper sendoff and the various storylines in the ongoing titles are wrapped up in a neat little bow, but that’s clearly not the motive of the crossover. Ultimately, the Gathering of Five is a plot device that will lead to a few storylines in the early days of the relaunch, and after that, the story’s simply forgotten. I will say that Todd Dezago handles the opening chapter with as much grace as could be expected, creating a link between the dangling Override plot and the gimmicky Gathering of Five concept. If you’re not aware of any of the behind-the-scenes drama, this might even read like any other issue of Sensational. It’s more than likely that Dezago would get around to Override and the Technomancers again, and this search for mystic artifacts plot could charitably be viewed as the latest scheme by Norman Osborn. MJ just might get a subplot that has her contemplating a return to modeling, and hey, it looks like this Alison Mongrain nonsense is finally getting resolved. There’s no real indication this issue that the entire line is being primed for an extremely awkward “back to basics” reboot, even though that’s exactly where it’s all headed. I doubt Dezago was particularly thrilled to be closing out his run on a crossover, but his work here is perfectly competent. He introduces all of the elements needed for the next chapter, never forgetting to throw in those human moments, such as MJ’s reaction to an old acquaintance who doesn’t know she lost the baby. He also gives the artist several cool things to draw, like the horrific beasts hidden inside the Technomancers’ lair (even though Joe Bennett seems to be strictly in fill-in mode, so they don’t look especially menacing). Everything that’s wrong with the crossover is still in the background, leaving the reader with an opening chapter that’s actually good enough to trick you into buying the next issue. The Plot: Scorpion reemerges as a sanctioned vigilante, working as an employee of Roxxon Oil and an unnamed government agency. Roxxon stages events that cast Scorpion as a hero and ingratiate him to the media. Later, Peter and MJ attend a lecture held by Jonah Jameson’s wife Marla at ESU, only to find it a target of Scorpion and the Black Tarantula’s hired thugs. Jonah and Marla are kidnapped. Later, NYPD detective Connor Trevane is able to help Spider-Man board a plane that follows them to South America. Spider-Man soon discovers Roxxon is working in concert with the Black Tarantula to create a new breed of super-soldiers. Marla’s scientific expertise is needed to complete the project, so Scorpion threatens to kill Jonah if she doesn’t cooperate. Spider-Man emerges and defeats Scorpion in battle. The Black Tarantula escapes, and Marla (who was wearing a wire the entire time) contacts the proper authorities. Connor Trevane informs Raymond Royton of the Department of Justice that he should now have enough info to indict Roxxon Oil. The Subplots: Peter is uncertain if he can defeat Scorpion, especially now that Scorpion has received upgraded abilities. MJ tells Peter she has faith in him, and congratulates him when he returns home. The government agency working with Roxxon is never identified. Marla Madison (not called Marla Jameson this time) is actually drawn on-model this issue, for the first time in almost two years. *See _________ For Details: A footnote reminds us that Spider-Man helped find Det. Connor Trevane’s son in Peter Parker, Spider-Man #44 (although the book was only known as Spider-Man back then.) Roxxon’s former subsidiary the Brand Corporation (which dabbled in human experimentation) was shut down in Amazing Spider-Man #236. Brand reopened without ties to Roxxon in Spider-Man: The Mutant Agenda #1. 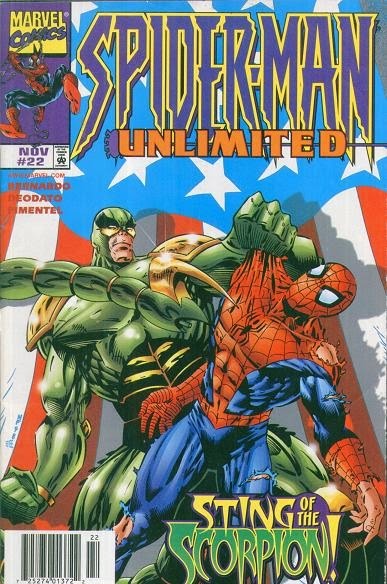 Ben Reilly (with Power Man and Iron Fist) faced the souped-up Scorpion in Spider-Man Unlimited #13, which also featured Roxxon’s efforts to acquire Rand-Meachum. Raymond Royton has been investigating Roxxon since Amazing Spider-Man #235. I Love the ‘90s: Spider-Man tells Detective Connor Trevane that he has to explain to him the meaning behind the bees in the X-Files movie. 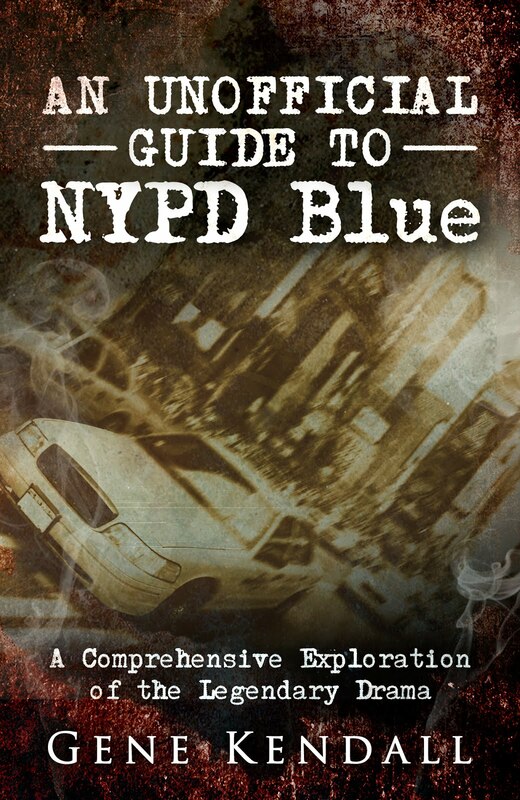 I have no idea what this is supposed to mean…are police detectives better than the average person at deciphering vague plot points in movies? Shouldn’t he be consulting a film critic? 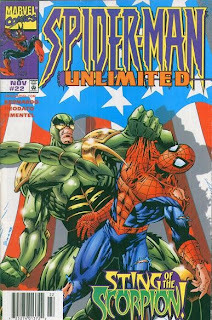 Review: It’s the final issue of Spider-Man Unlimited, even though an animated series and accompanying comic tie-in with the same name will debut in 1999. (The less said about that fiasco the better.) Years after that, in an effort to pump more Spider-product into the market, Spider-Man Unlimited is revived, this time as a standard format comic. It dies after a few years and no one seems to notice. 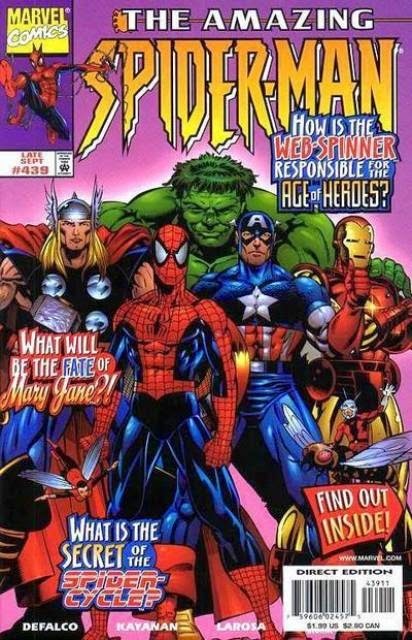 In 1998, the original incarnation is being cancelled to make way for the relaunch of the Spider-Man line, which will allegedly feature fewer, more easily accessible titles. The new Amazing Spider-Man #1, which is just two months away, will feature yet another story about a mysterious group granting the Scorpion upgraded powers. Editor Ralph Macchio either doesn’t notice or doesn’t care. There’s nothing particularly great about this issue, but I have to say that Mark Bernardo addresses my standard complaints about Roxxon stories. Roxxon is, I can’t believe this, actually being investigated this time, by a long-forgotten minor character from the Roger Stern days. The idea that Roxxon could just do WTF-ever it wanted and get away with anything because, "yeah, man, the corporations" was always ridiculous and I’m glad Bernardo remembered that Roger Stern was trying to address this ages ago. That doesn’t mean their plan this issue is bulletproof, however. There’s no clear reason given for why Roxxon feels the need to make the Scorpion a nationally famous superhero, which is a major plot point in the first half of the story before being dropped. I guess the assumption is that they’ll make stacks of money merchandising his image, which is the standard “corporation meets superhero” plot, but it would be nice to have some clarification in the actual story. More frustrating is the idea of an unnamed rogue government agency with an elaborate scheme to create super-soldiers operating right under the Department of Justice’s nose. I realize that government conspiracy stories were all the rage in the ‘90s, but just throwing that idea out there with no effort to give the agency some kind of identity or motive, and letting them get away scot-free, feels half-baked. All that said, the issue is fairly satisfying as a Spider-Man story, a problem that’s plagued Spider-Man Unlimited for much of its existence. 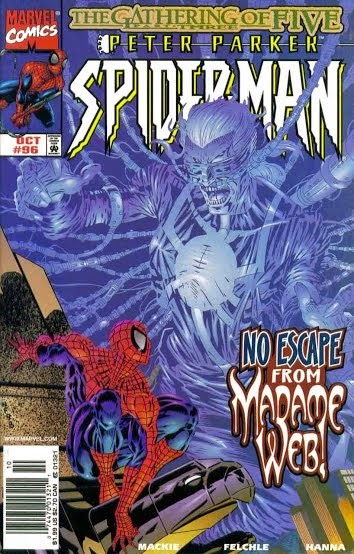 (Although to be fair, Bernardo’s handful of issues are usually good about presenting stories that feel unique to Spider-Man.) 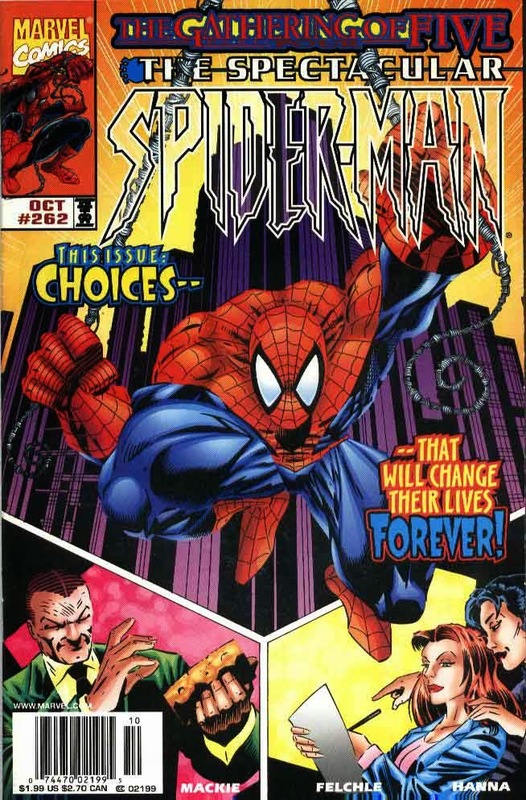 This time, Peter has an emotional issue to resolve, the supporting cast not only appears but has an actual role in the story, and a classic Spider-Man foe returns and is played up as a credible threat. In fact, the crux of Peter’s emotional angst this issue is his insecurity about facing Scorpion yet again. You could argue this is overblown given the number of times Peter’s succeeded in the past, but I think the story is effective in selling the idea that Scorpion’s more powerful than ever now and not a guaranteed win for Spidey. MJ’s there to give Peter a pep talk, as opposed to nagging him to death, which is a welcome sight these days. Any Scorpion story wouldn’t be complete without Jonah, which gracefully leads to Marla’s role in the plot. And that’s not all, because even more obscure characters start popping up! I half-expected Deb Whitman to make a cameo before the story was over. This feels specifically like a Spider-Man story, and not a random fill-in rescued out of the drawer and tossed on to the schedule. I realize that sounds like a low bar to clear, but even the monthly titles seemed to have a problem accomplishing this much in 1998. There once was a Spider…! The Plot: A thousand years in the future, researchers Zack and Lana discover the remains of a web-shooter in the ruins of Old Manhattan. Their tests confirm it belonged to Spider-Man, one of the leading figures of the Heroic Age. They speculate on what Spider-Man’s life was like, and the circumstances that led to him losing the web-shooter. In the present, Spider-Man searches for a lost girl in the sewers. 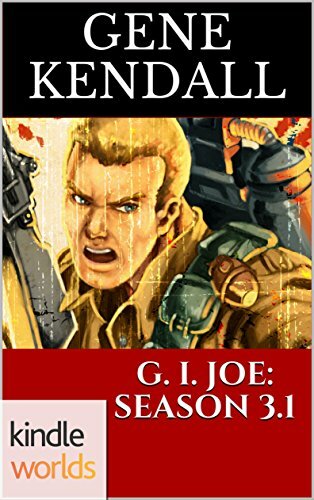 He clings to an unstable structure, which falls on his arm, breaking the web-shooter. Spider-Man convinces the girl to be brave and manages to rescue her in spite of his injured arm. The Subplots: MJ encourages Peter to stay home for the day, but changes her mind after seeing news footage of the missing girl. MJ spends the rest of the day alone. Review: I don’t pretend to know what was going on behind the scenes at this time, but Tom DeFalco’s final two ASM issues shipped bi-weekly, leading the way for John Byrne to debut early with the “Gathering of Five” crossover. Like the previous two issues, this is pure filler, but it is has more heart and humor than the two duds that preceded it. Zack and Lana’s attempts to piece together what Spider-Man’s life must have been like play against the reality that Spider-Man experiences as New York’s least appreciated hero, and there are numerous in-jokes for comic fans to enjoy. Lana, for example, is a fan of Spider-Man’s “Maximum Carnage” era, a fact Zack just can’t believe. DeFalco has also remembered to throw in a token Peter/MJ scene; one that once again mischaracterizes MJ as a domineering nag, but she’s thankfully less annoying than she was earlier in DeFalco's run. It seems we were supposed to be sympathizing for MJ during her previous bouts of obnoxiousness, an idea that was poorly conveyed to say the least. This issue has a brief scene emphasizing just how lonely she is when Peter is off playing hero, which is a fair enough avenue to explore. The human moments could’ve been sold better by Rafael Kayanan, who still struggles with basic acting, but I have to say that I’m still enjoying his interpretation of Spider-Man and I think his backgrounds look solid. Overall, the story is a decent goodbye for DeFalco, who was never able to hit his stride during his second Amazing stint. I’m glad that he was able to go out with one of his stronger issues.